I’ve long found stylized subway maps very beautiful in their apparent simplicity, while being able to communicate a wealth of information. The inventor of what we associate with subway maps was the Brit Harry Beck, who created the original London Underground map in his spare time in 1931, while working as a draftsman for the very same company. His superiors weren’t impressed, but after a limited print run turned out to be a huge success, hundreds of thousands of copies of the map were produced and history was made. Sadly, Beck’s employers sidelined him in creating follow up versions of the map he himself pioneered. The success and usability of the map is exemplified by all the world’s public transport networks now being mapped in ways very similar to Beck’s original vision, some losing the predicate map, becoming diagrams instead, for completely losing their geographical accuracy. One nice example of this is the Moscow metro map. But using Beck’s methods didn’t stop with capturing public transport networks. Plenty of maps of, still mostly, transport systems, in the style of Beck’s exist, not in the least a rather gorgeous one of US interstate highways. 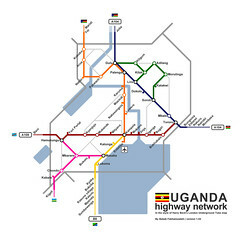 Shortly after arriving in Uganda, something, I really don’t know what, inspired me to do something similar, build a map of Uganda’s highway network, in the style of Beck’s Tube map. This weekend, with less on my hands than usual, I gave it a try. What do you think? You can also check out the map at maximum resolution. + On Google Maps, only two highways in Uganda are named, the A104 and the A109. The B8 isn’t actually named in Uganda, but is in Tanzania, to the south of the country. 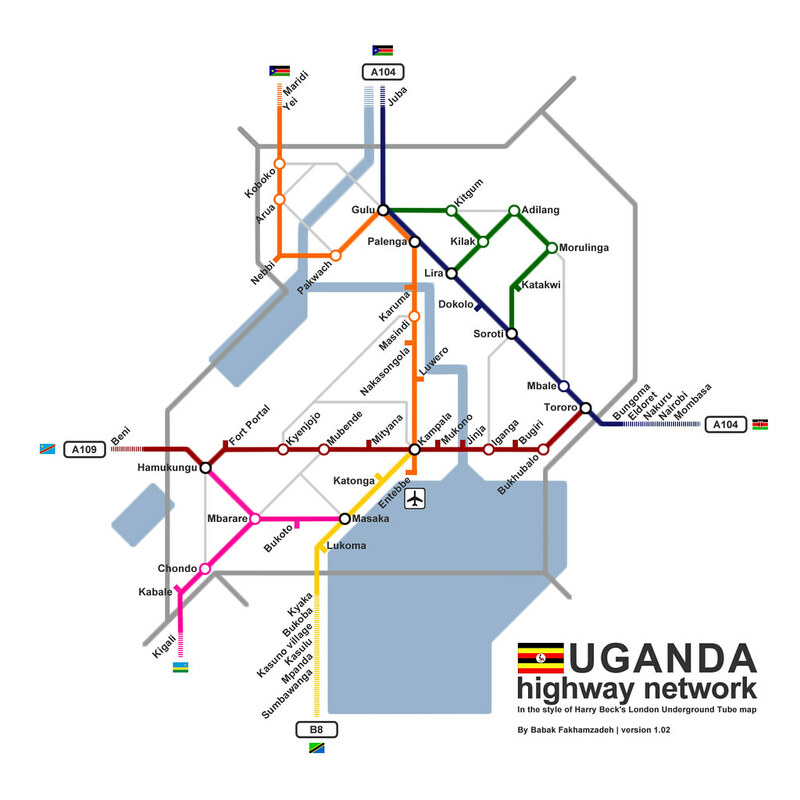 It also means that choosing the pink line to start in Masaka and not in Kampala, for example, is my own interpretation of the Ugandan roads network. Also, don’t think that, because those two roads are named, they’re any good. Particularly north of Gulu, towards Juba in Southern Sudan, the A104 is particularly bad. + The big lake is, of course, lake Victoria, with the Nile flowing northwards from it. + I took the liberty to use the Southern Sudan flag, instead of the Sudanese flag, which would have been, for now, accurate. + In case you’re wondering, Uganda is bordered by (clockwise from top), Southern Sudan, Kenya, Tanzania, Rwanda, DRC.